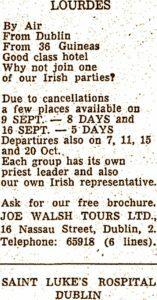 Joe Walsh did not invent travel in Ireland, although those that met him in his later years would have to be convinced otherwise. The Dublin to which he arrived in 1960 was a closed place. There were no travel agents north of the Liffey. All were in the city centre – none in the suburbs. The Thomas Cook office opened in 1875 on Dame St and 1892 on 118 Grafton Street, and so (important for intelligence gathering in the Irish War of Independence) was managed by Roy Kirk. He and American Express manager Jock McGregor were the village elders of the travel business. Other agencies (collectively known as the twelve apostles) included Express Travel. Proprietor Cathal O’Connell, whose agency was upstairs in Merrion Row. AW Hewitt’s Travel on 13 D’Olier St. Irish Travel in D’Olier St, Leslie Harris in Wicklow St, Meehan’s Travel upstairs in Grafton St, Michael Walsh in D’Olier St, Sadlier Travel upstairs in Grafton St and Twohigs Travel on Burgh Quay. In addition, several Atlantic Sea carriers existed, Cunard Line on Dawson St, Greek Line on Grafton St. and Holland-America Line plus airlines PAA (later called Panam) and TWA in prestigious premises on O’Connell St. The Aer Lingus offices were in Cathal Brugha St. where you could check-in and get a bus to the airport by the latest check-in time, 20 minutes. It was IATA who insisted on ground floor premises, forcing the three upstairs agencies to open on the ground floor. 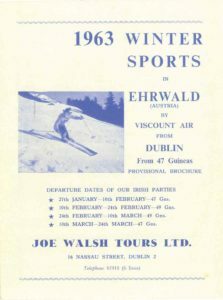 Irish Travel in D’Olier St, run by Thomas Francis Chisholm (“Chizzy”), were agents for the Olympic Games and other sports travel although this was limited until the 1958 World Cup qualifier in Wembley – just 12 fans accompanied Ireland’s soccer team on their May 1952 tour through war-torn Germany and Austria. Into this environment came Joe Walsh and everything changed. Joe was born in Bangor in 1931 and after his school career in St Patrick’s College Armagh, where he had one of the best results in mathematics from that year’s A levels moved to Belfast, where he worked for the old Ulster Transport Authority. He went on to London where he worked for Thomas Cook’s. On 31 January 1961 he opened in Nassau Street. On his first day he sold seven holidays and in his first year 1,800, of which 500 went to Lourdes and the rest to Italy for 49 guineas or Spain for £51. Walsh’s network of parish priests and bishops signed up parish and diocesan pilgrimages that were huge social outings on their own. The pilgrimage to Lourdes was the first trip abroad for many Irish people. Once there, they became more adventurous. 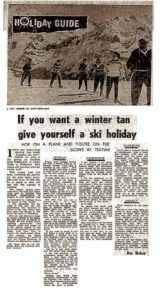 By 1970 he was selling holidays to Canaries, Cyprus and Greece and had opened a new shop on O’Connell Street. In 1973 he installed the first computer reservations system, his TV ads had made him a household name, along with the slogan had become “join the JWT set” and the Gallagher & Lyle song Breakaway. 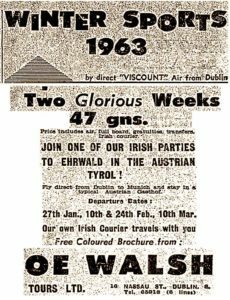 Walsh was soon joined by other entrepreneurial spirits, including Adrian Hopkins whose venture, Bray Travel jousted with JWT before collapsing suddenly in 1981. 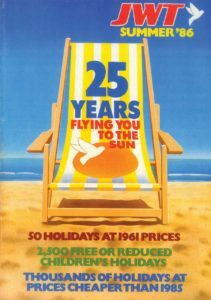 By 1981 there were 240,000 package holidays on sale, but the dark clouds of recession were gathering over the industry that was busying itself with selling sunshine. 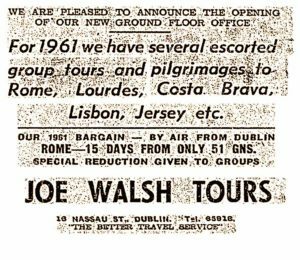 A lively turnover of staff passed through Joe Walsh Tours. Grainne Caffrey, Nuala Brady, Helen Hade, Pascal Dunne and Sheila Fitzpatrick are on the committee that plan a reunion for the month’s end. Those attending include Des Abbott, Ed Burke, Grainne Caffrey, Darach Culligan, Paddy Dignam, Alan Lynch, Niall McDonnell, Brian Nevin, Eugene Magee and Carol Anne O’Neill. The holidays were expensive, more than a month’s average wages, but so were the running costs. Viscounts could only fly as far as Barcelona before they had to refuel. 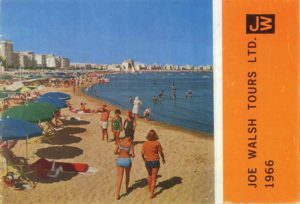 JWT once had 70 tourism reps abroad, in the 1980s the number had dropped to 40. In safer destinations like Lourdes it was one to every 177. Almost all the holidays were booked in a spring rush, 65pc of holidays booked by April. The brochure launch was simple, you hired the Burlington and Gay Byrne and everybody showed up. 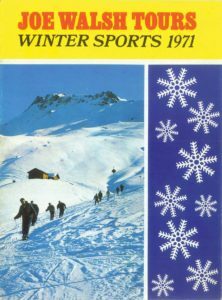 Between 1980 and 1989 eight tour operators and nineteen travel agents collapsed, and 6,600 people had to be rescued or have money refunded. The death of Joe Walsh on New Year’s Day 1995 removed one of the key players from the market and the brand did not survive his death. Joe Walsh Tours evolved as a successful specialist service run by his sons Cormac and Barry. JWT, stripped out as a separate brand, was purchased by Falcon, or rather by its English parent First Choice. It remained on brochure titles with its own branding but was to become marginalised in the next push. 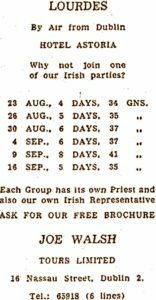 Fifty years later it is a social group, a sort of giant “past pupil’s union” is how Cormac describes it, of friends and colleagues who learned about travel together from the great man. The industry would be much the poorer without him.